James Howells of Wales is one of the Bitcoin community’s most tragic figures. The sum at stake in Howells’ case brought him lots of attention, but he’s certainly not the only person to lose track of his bitcoins. Outside of anecdotal evidence, however, there’s really no way of knowing how many people have similar tales—or how much they’ve lost. According to the founder of Bitcoin Black Friday, only 78% of bitcoins in existence were being circulated in 2012. Since it’s impossible to tell whether dormant coins are lost or simply being saved, the holiday aimed to get hoarded bitcoins back in circulation. Researchers found that a full 64% of bitcoins have never been spent; the question is whether they still can be. According to Greg Schvey, a Bitcoin researcher, it’s hard to distinguish lost bitcoins from those people are just saving for a rainy day. There is, however, one big clue. It starts with the block chain, a public ledger that includes every transaction ever made within the currency. When miners verify new transactions, what they’re really doing is appending new blocks onto the block chain. Schvey cofounded The Genesis Block, a company that analyzes the primary block in the block chain, a.k.a. the genesis block. Since each block contains a hash—a cryptographic string of data—from the previous block, and the genesis block is guaranteed to always be the initial block, each bitcoin is guaranteed to trace back to it. The genesis block is arguably the most useful innovation in the Bitcoin currency because it eliminates the chance of double-spent or counterfeit bitcoins. When every legitimate bitcoin can be identified thanks to its genesis block hash, it’s impossible to create fakes. And for Schvey, this means the genesis block gives him the data to track every bitcoin that currently exists today. According to his company’s research, 55% of bitcoins that have been issued to date were active in the third quarter of 2013; 10% of bitcoins haven’t been active since 2012. And a substantial 35% haven’t been spent since 2011. It’s this third number that is most likely to consist of lost coins, though they could just be being hoarded. Since only a finite number of bitcoins will ever be mined, Bitcoin is a deflationary currency. Once miners unearth 21 million coins, that’s the total number of bitcoins that could possibly ever exist. But thanks to lost and forgotten wallets, the number will likely be far lower than that. Schvey said the finite number of bitcoins will result in rising prices, and consequently, people who have their bitcoins in savings will start to take them out. But Can Lost Bitcoins Be Recovered? 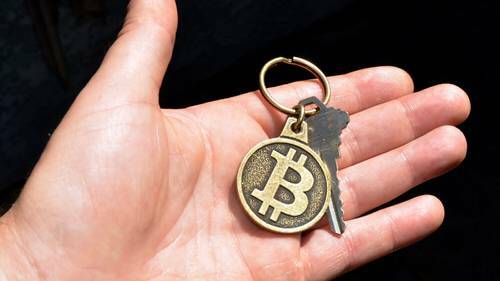 Whether due to irrecoverable passwords, forgotten wallets from when Bitcoin was worth little, or the death of the bitcoin owner, it’s safe to say there are lots of people besides Howells who’ve lost their bitcoins. The question is whether or not those coins are lost for good. Not everyone is so skeptical. As the price of Bitcoin continues to surge and the demand for cracking long-forgotten rises, services are popping up to assist people in recovering their wallets. But even these options are limited. There are also tutorials for recovering your bitcoins in the aftermath of a technical difficulty, like if the hard drive you had them on broke down. But unfortunately for people like Howells, tutorials like this one require you to actually be able to locate the drive where the bitcoins are stored. Not to mention, success stories are rare and exuberantly celebrated. 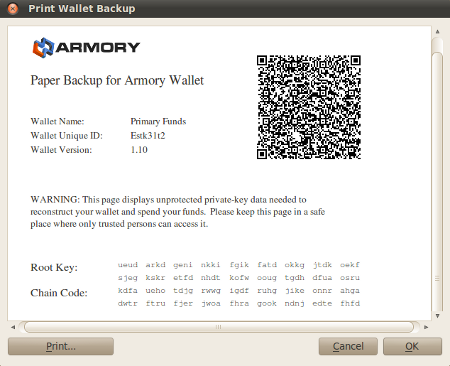 Screenshot of a Bitcoin Armory paper backup. You put one in your house, one in your safety deposit box, and give another to a family member to keep at their house. Then, even if your house goes on fire and you lose the first hash, you still have two to recover your wallet with. When this reporter downloaded Armory’s software on a Windows computer, it took nearly eight hours for it to sync with the block chain and become usable. It was overkill for my roughly $5 in Bitcoin, but Armory users are willing to take the trouble for much larger fortunes.